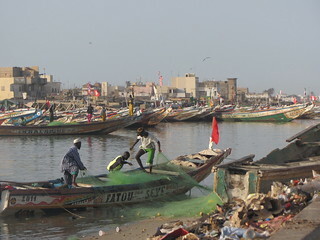 Dakar, the capital of Senegal, is home to 2.5 million people and is one of the most vibrant cities in western Africa. Bordered by the Atlantic ocean, Mauritania and Mali, Gambia, and several other small countries, Senegal was a French colony from 1659 to 1960. It is now an independent nation and features a unique blend of cultures, languages and ethnic groups. Islam is the predominant religion and mosques form a strong core of the cultural and spiritual life of its people. In Dakar, modern amenities mix well with the cultural tradition of the Wolof, Peul and Sérère peoples. Around the city, you'll find majestic cliff walks, beaches, and major historic attractions like the Grand Mosque and Dakar Cathedral. The Dakar, Senegal program, offered through Hobart and William Smith Colleges’ affiliation with the Council on International Educational Exchange (CIEE), is based at L'Institut Superieur de Droit de Dakar (ISDD). ISDD offers degrees in Law and has a Senegalese student body. The special attraction of this program is its focus on interaction with the local population, not as folklore but in everyday life circumstances. As a developing nation, Senegal offers a wonderful opportunity to examine the influence of European and American culture on traditional societies. It also gives the students a chance to look at their own culture from a very different point of view, to perfect their language skills in French (and learn basic Wolof) and engage fully in West African life through placement with local host families, internships with local schools and NGOs, participation in ISDD student activities, and through independent exploration. Students will receive four credits for courses taught entirely in French in subjects such as French grammar, composition, and conversation, but also in other disciplines including literature, history, international relations, philosophy, religion, and sociology. Electives are available in Wolof language and students may request to undertake an independent community-based field project (internship) in lieu of one course with the support of their HWS faculty advisor and the permission of the HWS/CIEE academic program coordinator in Dakar. For more information on courses offered, please visit the CIEE Dakar, Senegal page here. Scroll to the bottom of the page (Academics) and click on course descriptions. This program is ideally suited for students interested in French & Francophone Studies, Gender Studies, Development Studies, Public Health, and internships and/or experiences that involve students in the local community. The program is open to sophomores, juniors and seniors in good academic and social standing who are mature, independent and adaptable with a minimum GPA of 2.75. In addition, applicants must have the equivalent of four semesters of college-level French prior to participation in the program, although more French is preferred. Admitted students are required to take a Senegalese orientation course at HWS in the fall semester preceding the program. Students are matched with local Senegalese host families, some within walking distance but others a short bus ride from the CIEE/ISDD campus. The student usually has her/his own room, furnished with at least a bed, a study desk, and a closet. Families are chosen not only for their ability to provide the basic necessities, but above all for their interest in sharing their lives with their guests. Host families provide two meals per day and students can purchase lunch near the study center. Host families tend to view U.S. students as adopted children and expect them to share time with their family and friends. The Senegalese live simply; amenities such as washing machines or microwaves are often unavailable. A series of guided excursions are offered as part of this program. Among the locations visited during previous semesters are the wildlife park of Doudj; Gorée Island, an important location in the slave trade; and the French colonial city (and former capital city) of Saint-Louis. During orientation and throughout the term, there are shorter excursions within the city of Dakar to important cultural and historic sites. Students will be charged standard HWS tuition and fees, room fees, a 1/2 board fee, and a $600 administrative. This will cover tuition for a four-course semester, health insurance, program-related activities and excursions, and homestay with partial board. Students should plan to bring the remaining 1/2 board fee to cover meals not included (about $1400). Additional expenses not covered include airfare, books, immunizations, visa, and personal expenses (laundry, entertainment, ground transportation, and independent travel). We estimate airfare at $1800 from the East Coast, books at $200, immunizations at $300, and visa at $65. It is difficult to give an accurate estimate of personal expenses because student spending habits differ considerably. We would suggest a minimum of $750 - $1,000 above and beyond meal expenses. However, students on a tight budget should be able to manage with less. If you are concerned about finances, we strongly encourage you to talk to the CGE staff who can offer information and advice based on your specific situation. This program is offered every spring semester in odd years.